238 pages | 27 B/W Illus. 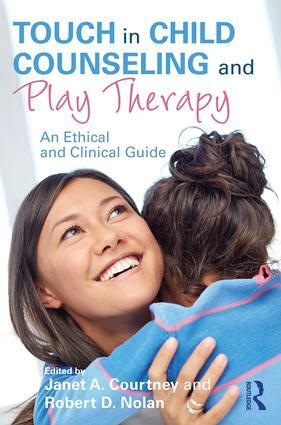 Touch in Child Counseling and Play Therapy explores the professional and legal boundaries around physical contact in therapy and offers best-practice guidelines from a variety of perspectives. Chapters address issues around appropriate and sensitive therapist-initiated touch, therapeutic approaches that use touch as an intervention in child treatment, and both positive and challenging forms of touch that are initiated by children. In these pages, professionals and students alike will find valuable information on ways to address potential ethical dilemmas, including defining boundaries, working with parents and guardians, documentation, consent forms, cultural considerations, countertransference, and much more. "Touch in Child Counseling and Play Therapy covers the multifaceted clinical and ethical challenges that arise in a diverse array of therapy settings with children from infancy to adolescence. This has been a very ‘touchy’ and controversial subject which the authors skillfully review. Touch experiences are inevitable in work with children, and the concluding chapter covers five important core competencies in dealing with these. The book will be very helpful for clinicians across disciplines." "In this groundbreaking book, Dr. Courtney and Dr. Nolan bravely broach the often-considered taboo subject of touch within child therapy. Through their own expertise, as well as that of other experienced therapists, these authors lead readers through ethical, legal, and competency issues related to using touch in therapy in order to guide therapists through best practices and effective therapies that use touch to heal the hurting child." "Courage, depth, wisdom, and dignity are four words that flowed throughout the reading of this groundbreaking book. In their exploration of the life-enriching power of touch, Drs. Courtney and Nolan have built a significant professional and ethical bridge that has been desperately needed for all of us who are working with children. Add this ‘must-have’ creatively crafted book to your library and be touched." "Brilliant and bold, this is a groundbreaking, long-awaited book on a topic that needs thoughtful discussion and an exchange of ideas. The editors and contributors of this volume build on the pioneering work of Viola Brody and are to be commended for taking the lead on this timely and vital topic." Janet A. Courtney, PhD, LCSW is founder of FirstPlay® Therapy and an adjunct professor at Barry University School of Social Work in Miami Shores, Florida. She is a TEDx speaker and past president of the Florida Association for Play Therapy.She offers certification training to practitioners in FirstPlay® Infant Massage Storytelling and Kinesthetic Storytelling®. Robert D. Nolan, PhD, is the former executive director of the Institute for Child and Family Health (ICFH) in Miami, Florida. He was a founding member of the Florida Association for Play Therapy and served as its first president. In 2012, he received the lifetime achievement award from the United Way of Miami-Dade.